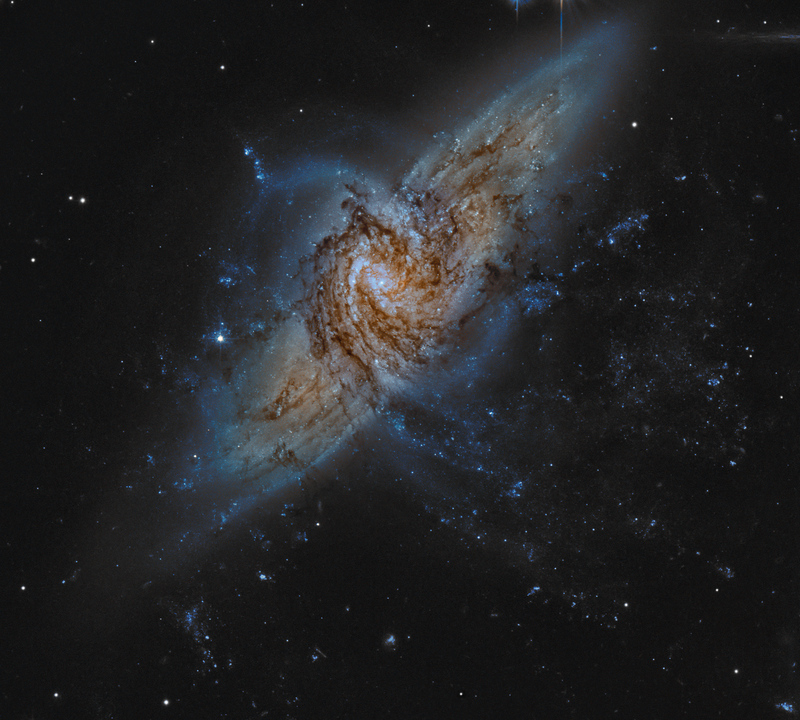 NGC 3314 is actually two large spiral galaxies which just happen to almost exactly line up. The foreground spiral is viewed nearly face-on, its pinwheel shape defined by young bright star clusters. But against the glow of the background galaxy, dark swirling lanes of interstellar dust appear to dominate the face-on spiral's structure. The dust lanes are surprisingly pervasive, and this remarkable pair of overlapping galaxies is one of a small number of systems in which absorption of light from beyond a galaxy's own stars can be used to directly explore its distribution of dust. NGC 3314 is about 140 million light-years (background galaxy) and 117 million light-years (foreground galaxy) away in the multi-headed constellation Hydra. The background galaxy would span nearly 70,000 light-years at its estimated distance. A synthetic third channel was created to construct this dramatic new composite of the overlapping galaxies from two color image data in the Hubble Legacy Archive.